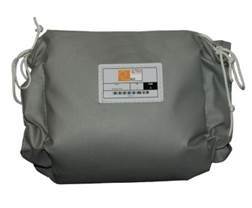 We provide a wide range of insulation jackets which are supplied with integral heating cables. These units are manufactured to suit each individual application. They facilitate quick and easy removal of the complete assembly for maintenance. If required we can provide an integral heating cable is used to maintain the equipment at the required temperature, which may vary from freeze protection to high temperature process maintenance. Available in a variety of shapes, sizes and configurations, our thermal insulation jackets are wrapped around external pipework casing, valves or flanges to control temperature and maintain substance flow rate. Each unit may be supplied with a trace heating power connection junction box or thermostat to provide temperature control. The units may also be used within Hazardous areas, as all of the trace heating materials hold ATEX hazardous area approvals.